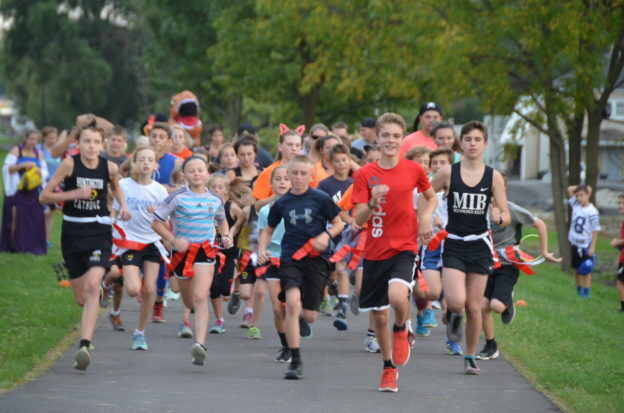 Over 75 runners and walkers of all ages took to the Erie Trail Saturday, October 14 for the Inaugural HARTA-ween Zombie Dash. Participants choose either the 1-mile or the 5K route. The goal of the race was not to get the best time, but to finish the race with as many lives left on your life belt as possible. Human Zombies hid along the route waiting for the runners and walkers to approach them. Their goal take as many lives from the runners and walkers as possible. Families of the participants also had the opportunity to purchase food from the Berg Buggy, play games, and take pictures with Zombie props.